Terror Films is debuting the official trailer and poster for their first Spanish language horror film, FORWARD. FORWARD is set to be released Tuesday, May 1 (today!). 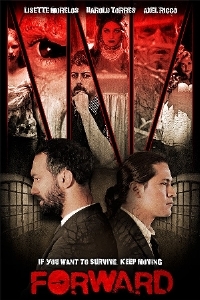 The film was written and directed by Henry Bedwell (Darker Than Night) and stars Harold Torres and Axel Ricco as "two assassins hired to avenge their boss. The job leads them to what appears to be an abandoned hotel. However, they soon find themselves in an unexpected maze of madness, where realities intertwine and nightmares come to life. Faced with an evil demon named Larissa - played by Latin America television star Lisette Morelos - the duo realizes that the gates of hell prove to be closer to our plane of existence than either of them could have expected." FORWARD has been the recipient of multiple film festival awards. Awards include: Best Feature Fiction at the 12 Month Film Festival, winner of Best Fantasy Film at the Feratum Film Festival and the Laurel of Achievement at Cinema Grand Prix. Terror Films will initially release FORWARD in North America on Digital platforms, with English subtitles.